Contains natural essential oils. 5x more fragrance control.Crisp Linen & Lilac - Bring to life the crisp, cool elegance of fine linen, accented with the fragrant touch of wild lilac. Contains natural essential oils extracted from plants & flowers. 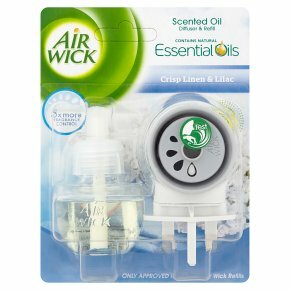 Air Wick Diffuser gives you 5X more fragrance control to ensure fragrance is just right for any room large or small so your home always smells fresh and welcoming. Directions for Use: Retain instructions for future reference 1. Remove the plastic cap from the fragrance bottle. 2. Firmly insert fragrance bottle into the underside of the warmer unit, until a 'click' can be heard. Ensure the fragrance bottle is kept vertical at all times. 3. Plug the assembled unit into an available socket. 4. To increase or decrease the fragrance intensity, rotate the dial on the top of the warmer. Largest mark = max setting. 5. To replace the fragrance bottle, remove the device from the outlet and pull the bottle downwards.